This year gartner places Oracle DW and Microsoft almost at par in data warehousing. In October 2009 ZL technology is suing Gartner for $1.7 billion for not accurate positioning companies in their magic quadrant. ZL accuses that Gartner is driven more by promotions and funding than reality. Companies are willing to fund such research, according to ZL, as Gartner reports move executive decisions. 2. 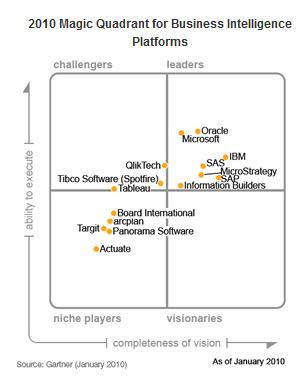 2009 created a frenzy of major BI platform consolidations on one side, and resilient pure-play vendors on the other. 5. There is a brewing bifurcation between IT and business with IT leading the IT and technology stacking principles and business leading with pureplay faster time-to-value deliverables that the mega vendors cannot provide. The acquisition turmoil is taking its toll with customer decisions. It is very cyclical and predictable. Initially there is concern and uncertainty, like the Gartner 2010 #5 priority for BI, followed by harmonized solutions, and often leads to a product replacement or change (Customer dread). This transition takes time and is neither easy for suppliers nor customers. Gartner predicts that the current trough is going to be very temporary indeed and BI is predicted to remain the fastest growth area in IT for the next decade or so. SAP dominates the number game with the largest deployments and their Business Objects acquisition seems to be positioned very well indeed as are their other offers. BOBJ brings much needed Ad-Hoc capabilities that were lacking in the BI functionalities. However SAP BI customer rating continues to lag and continue to be lower for a big player. Some changes in VM ware contracts are causing additional confrontations. Customers continue to reexamine their BI strategies between BEx and BOBJ.